Lots to variety: This long-established resort has lots of different attractions to keep you amused for action-packed holidays. On Platja d’Aro holidays 2019 there are Roman ruins, a medieval castle, a theme park, a water park, a quaint doll museum and lots more besides! So you can enjoy the fun and variety of all inclusive holidays, with the freedom and reduced cost of self-catering holidays. Several beaches: With some holidays you only get a choice of one or two small beaches – that’s certainly not the case with Platja d’Aro holidays! There are actually seven beaches within Platja d’Aro, and the main beach Platja Gran is over 2km long. Golfing holidays: Club Golf d’Aro is just 3km away from Platja d’Aro, and offers a good degree of challenge with sloping holes and large water lakes. There’s also a smaller Pitch & Putt course so you can get some practice in while you’re at the resort itself. Benedormiens Castle: This castle has a long history dating back to the 11th century. Designed to protect Platja d’Aro against attacks from the Moors, it was actually severely damaged by a civil rebellion in 1462 but has now been restored to its former glory. So much so in fact, that it is now used as a modern art gallery and has housed works by famous names such Salvador Dali (a local of the Costa Brava area) and Navarro Vives. Vila de Pla de Pal Ol: This Roman excavation site dates back to the 1st century BC, and the large villa indicates signs that Platja d’Aro was used for farming, producing wine and exporting clay. It’s quite an impressive sight to see, and it’s recommended you visit even on beach holidays to Platja d’Aro. Doll Museum: There are over 350 dolls on display in this museum in Platja d’Aro. They have been collected from all over the world and have many different styles. An international and unusual collection to see on your holidays to Platja d’Aro, even the fabrics that have been used to create them give an indication as to where they were made. Golfing: For those who take their golf seriously even during their holidays, your best option would be to head out to the Club Golf d’Aro, just 3km west of the town. This 18-hole championship level course was created with over 1,000 trees, 2 water lakes and lots of sand bunkers! But if you fancy a more relaxed game of golf on your holidays, there’s a small Pitch & Putt actually within the resort of Platja d’Aro. Magic Park: This theme park/fun fair has a whole lot of different things to do, ensuring a fun day on family holidays to Platja d’Aro. There’s a real focus on entertainment of the electronic variety as you’ll come across simulators, arcade games and fruit machines, as well as pool tables and an ice rink. Aquadiver: An exciting water park with colourful rides perfect for fun on holidays to Pineda de Mar. With names like Rapid River, Waterfall and Kamikaze you’ll probably know what to expect! Alongside the fast-paced slides there are some relaxing quieter sections and mini-rides and pools for younger children on family holidays. Platja Gran: At 2.2km long and 70m wide, Platja Gran is one of the biggest beaches on the Costa Brava. The sand is soft and golden and leads into gently sloping clear water. Being such a popular beach, it caters to tourists on holidays to Platja d’Aro well as there are over 20 showers, clean toilets and lifeguards on duty. Cala Sa Conca: Much smaller and quieter than Platja Gran, this beach offers a slice of tranquillity in this busy holiday resort. It’s very picturesque too, as the rocky headlands enclosing the cove are covered in pine trees and green shrubs. Cala Rovira: Perhaps the most beautiful beach in Platja d’Aro. 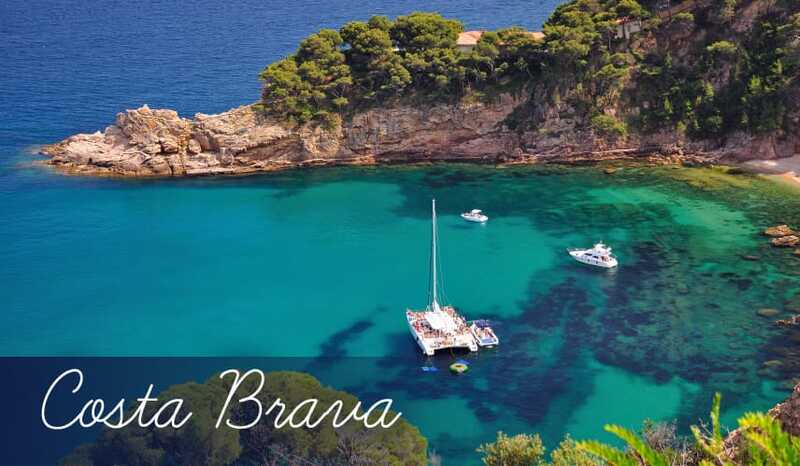 Cala Rovira is only 200m in length but it has wonderful views of the densely forested mountains in distance. The water stays shallow quite far out to sea so it’s safe for children’s swimming during family holidays too. Llevant: A restaurant near to the seafront which largely caters for the tourist crowd who come to Platja d’Aro for cheap holidays every summer. The menu is extensive and varied and incorporates lots of classic dishes like pizza, paella and good old burger ‘n’ chips! New Amsterdam: Another rather tourist-focused menu for a home-from-home experience on your holidays, but this restaurant is a little quieter and more relaxed than most. A nice touch is you get bread to start and a plate full of salad with your meal all for free – meaning great value for budgets on a shoestring during cheap holidays to Platja d’Aro. Sa Cova: Part of a hotel, this classy restaurant offers a fine dining experience. The wine menu is almost as long as the food menu, which shows the expertise of the waiters here! Although it’s certainly not for diners trying to save the expense on cheap late deals to Platja d’Aro, it’s worth treating yourself to slap-up meal here at least once if you fancy a little luxury. Some good bars: Platja d’Aro doesn’t offer the liveliest holidays in the world, and if you’re looking for all-out action nightlife on the Costa Brava you’d be better off having your holidays in Lloret de Mar. Having said that, Platja d’Aro can still stake a claim to a good few bars, with ones such as Cafe del Mar, Bar Skull and Can Basso worthy of mention. Cafe del Mar tends to take a relaxed approach to late night drinking, whereas Bar Skull or Charlie’s Bar will be your places of choice if you’re up for a manic night of partying! Shopping streets: There are two main streets for shopping in Platja d’Aro – Avinguda De S’Agaro and Main Street. Av. The area of Av. De S’Agaro has a number of different shops including fashion boutiques, jewellery shops and toy stores. Main Street similarly has a good variety of different shops, but you’ll notice there are a few more brands and designers around here. Who knows? You may even be able to find a bargain on during your cheap holidays to Platja d’Aro.